Back cover blurb: The nation is gripped by the infamous 'Ragdoll Killer'. Every news bulletin and headline is obsessed with this story. Your friends, your family and your neighbours are all talking about it. Believe the hype. 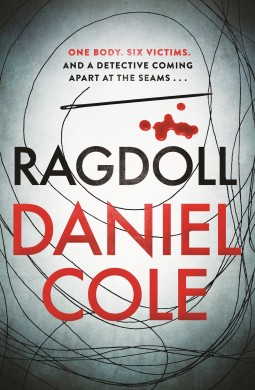 Sold in over 32 countries and counting, RAGDOLL is the standout thriller of the year. A body is discovered with the dismembered parts of six victims stitched together like a puppet, nicknamed by the press as the 'ragdoll'. Assigned to the shocking case are Detective William 'Wolf' Fawkes, recently reinstated to the London Met, and his former partner Detective Emily Baxter. The 'Ragdoll Killer' taunts the police by releasing a list of names to the media, and the dates on which he intends to murder them. With six people to save, can Fawkes and Baxter catch a killer when the world is watching their every move? 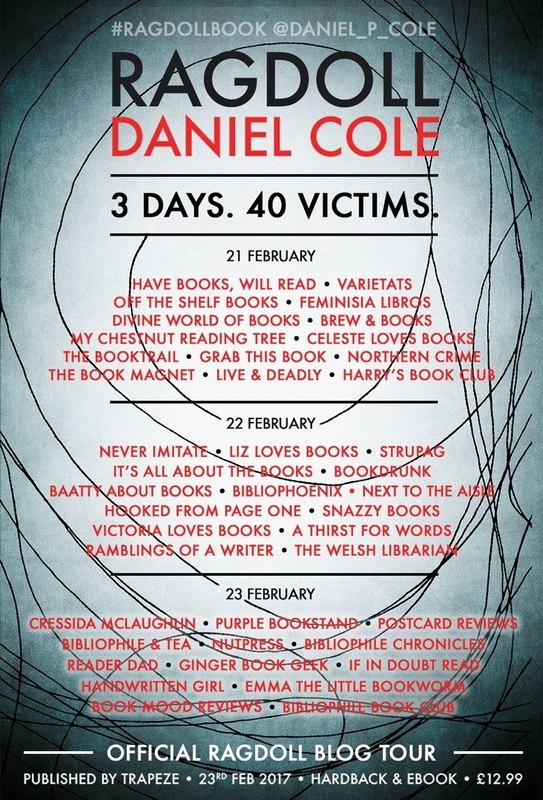 Ragdoll is Daniel Cole's debut novel. And wow, what a debut it is... Born from the idea of a tv series/show, this novel showcases Daniel Cole's writing talents from the outset. 4 years before the nation is gripped by the Police pursuit of the so called "Ragdoll killer", Detective William Oliver Layton-Fawkes (Wolf) is restrained and confined to a secure unit after attacking Naguib Khalid (the notorious "Cremation killer") on the final day of his murder trial. Many think that Wolf shouldn't return to the Met, but his former partner Detective Emily Baxter is delighted to have her old friend and colleague reinstated. It isn't long before they are thrown head first into their first investigation. A body has been discovered hanging from a ceiling in a macabre display in a building opposite Wolf's flat. But this is not just any old body. This hanging display feature has the dismembered parts of six different victims stitched together to make one 'body'. Earning the killer the "Ragdoll killer" moniker. If this wasn't bad enough, the press, namely Wolf's ex-wife Andrea, have got themselves a list of six people, supposedly the killer's next victims - Along with the dates that they are to be murdered. The media frenzy that follows the release of the list supposedly is to help support the Met in their quest to catch the killer. Their efforts to assist are laughable to say the least. Their motives purely selfish. Wolf and Baxter certainly have their work cut out for them and the media scrutiny isn't helping. Their priority to ensure the first person on the list is safe, is equal to that of finding and bringing the killer to justice. Wolf is not the only detective on his team with a colourful past, and Ragdoll is full of some truly troubled detectives. Although the content is often dark, Ragdoll has some funny moments. But then I would imagine you'd have to have a pretty screwed up sense of humour to get through most days as a detective on this kind of case. Ragdoll is a pretty perfect debut. My only disappointment was the ending - simply because I didn't want it to end. I really hope there is more to come from Wolf and Baxter. Ragdoll is available from 23 February 2017.